WASHINGTON (Reuters) - A U.S. federal appeals court on Friday threw out a lawsuit brought by an Arizona sheriff who argued that President Barack Obama's executive actions on immigration were unconstitutional. 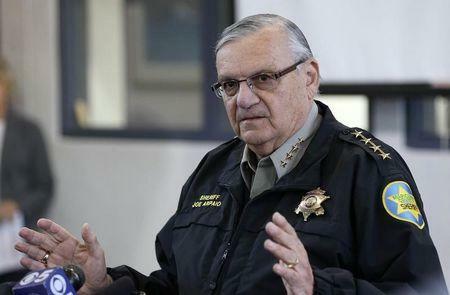 The U.S. Court of Appeals for the District of Columbia Circuit upheld a district court judge's finding that Maricopa County Sheriff Joe Arpaio did not have grounds to sue. Arpaio claimed his office had been injured by Obama's November 2014 orders that were designed to ease the threat of deportation for about 4.7 million undocumented immigrants. "We are pleased that the D.C. Circuit did not allow Sheriff Arpaio's lawsuit to stand in the way of commonsense measures to advance public safety and bring greater accountability to our immigration system," Eric Schultz, a White House spokesman, said. Arpaio's lawyer, Larry Klayman, said he would seek Supreme Court review of the ruling. He described the decision as "intellectually dishonest. Klayman had argued that Arpaio would be harmed by the immigration action because there would be more crime as a result. But the court found Arpaio did not have legal standing. To prove standing, plaintiffs must show they have been directly harmed by the challenged action. Judge Nina Pillard, writing on behalf of a three-judge panel, said Arpaio's predictions of higher crime rates and an increase in the jail population "rest on claims of supposition and contradict acknowledged realities." The Obama administration provisions would give temporary legal status and work permits to eligible immigrants. In April, he admitted to civil contempt charges in a Phoenix court after failing to comply with several court orders banning his police force from racially profiling immigrants. In June, the Supreme Court upheld a 2014 appeals court ruling that struck down an Arizona law that denied bail to illegal immigrants charged with certain felonies. Obama's executive actions are currently on ice, after a Texas judge ruled against his administration in February. That more substantive challenge brought by 26 states, led by Republican bastion Texas, will be heard by the 5th U.S. Circuit Court of Appeals in July and could ultimately be decided by the Supreme Court. Republicans have brought a swath of lawsuits against administration officials on immigration and Obama's signature healthcare law over the past year, aiming to curb what they view as executive overreach.